The Campaign Title appears at the top of your campaign - this is both how your supporters identify the campaign, and also how you identify it in your reporting - so be sure all campaign names are unique! Unlike a title, a tagline for your campaign is not required and can be left blank. The tagline is a subheading that appears directly under the title. To edit the campaign title, go to the Campaign Settings tab in the Campaign Editor. Click on the Title & About section to expand, then enter the new title under “Title”. 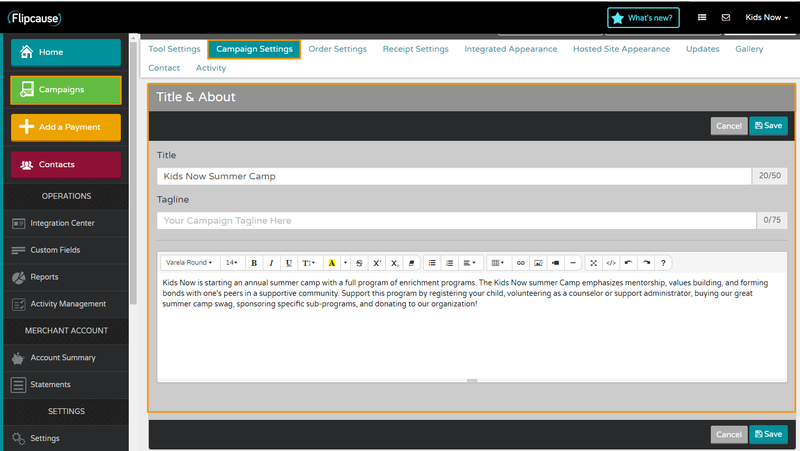 You can also add a tagline to your campaign, which appears underneath the title. Click save!